Those jerks in Gore Quaffer are going down! 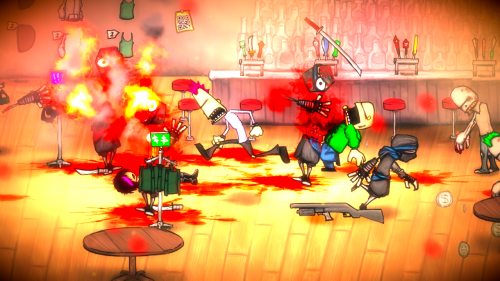 Still hard at work on their punk rock-inspired brawler/RPG Charlie Murder, Ska Studios recently released a trailer teasing some more information about the upcoming co-op XBLA game. Introduced and narrated by a dishwasher and a unicorn, the trailer shares some behind the scenes info on the game's development, including new tidbits about customizable clothing and character upgrades via tattoos. Quite a bit of gameplay footage is also shown. Charlie Murder is inspired by the likes of Scott Pilgrim vs. the World and River City Ransom. Just with more punk and grunge and violence. The game will support co-op play for up to four players both locally and online. No release date has been set.